Bee Pollen is gathered by worker bees from the male element of flowers used for fertilization of the plant. Bee Pollen can be used as a natural weight control to increase calorie burning; it also can increases strength and stamina without chemical side effects. Bee Pollen has shown to improve the crucial recovery power of athletes after stressed performance during a two year research program at Pratt Institute in New York. Pollen is the male reproductive cells of flowering plants. Successful pollination with a receptive female flower enables seeds to be produced. For bees, Bee Pollen is the most important product they collect and flowering plants and bees have co-evolved; both dependent on the other for their very existence. 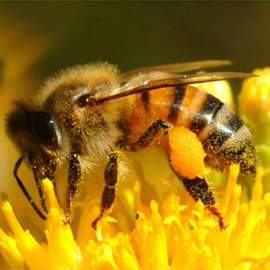 All of the honeybee’s nutrients throughout its entire existence are supplied by Bee Pollen. Man’s early focus on honey so predominated, that not a great deal of attention was given over to the collection of Bee Pollen. In the last several decades however, this had gradually begun to change. First the Eastern Europeans began to prize Bee Pollen, then Western Europe and North America followed suit. During the 1970’s and 1980’s, this interest became so active in America that at least one president became an avid consumer. Not all Bee Pollens are created equally. By consuming a variety of types of Pollen, the nutritional balance for bees and humans is considerably enhanced. Honey bees have the greatest dietary range of any organism (Schmalzel, 1980). This mixture of Pollens also helps dilute what might otherwise be potentially tonic alkaloids and other toxins. It does, through, make it more difficult to control quality and chemical analysis. Generally speaking, therefore, the overall chemical composition of Bee Pollen is as follows: 24% Protein, 27% Carbohydrates which are primarily the simple sugars fructose and glucose added by the honeybee in the form of nectar and honey to bind the Bee Pollen grains. Pollen form grasses also contain starches. Most Bee Pollen only contains about 5% fat but these are poorly digested by humans and therefore don’t contribute many calories. Bee Pollen also is on record as being one of the riches sources of trace nutrients such as iron, calcium, potassium, zinc, copper, magnesium and manganese. One to several ounces will provide the entire daily allotment of these nutrients. It is low in sodium but very rich in most of the B-vitamins such as thiamin, riboflavin, niacin, folic acid, pantothenic acid, biotin, and pyridoxine. It does not contain lipid-soluble vitamins D, K, and E.
Bee Pollen contains more protein than most expected protein sources except for chicken; it has 50% more protein than beef. It also contains 7.5 times more iron than beef. It is very rich in carotenes, metabolic precursors of vitamin A, and in terms of vitamin A equivalents, is several times richer than cabbage, considered to be an excellent source. In fact, except that Bee Pollen lacks the vitamins listed above, it would surely rank as a perfect human food. Compared to many of the foods Humans do consume, it surely is very close. In fact, it has a nutritional composition that surpasses that of virtually any food typically eaten. Most suppliers of Bee Pollen products recommend consumption is small amounts, at least in the beginning. There is also some concern for the potential of allergic reactions, yet there are remarkably few reports of this and millions of people do consume Bee Pollen. Some people who consume Bee Pollen and are hypo-sensitive are subject to stomach and gastrointestinal upset. General itchiness, fatigue, asthma attacks, headaches and diarrhea have also been reported. In order to place Bee Pollen as a food allergen in proper perspective, it is important to note that no deaths have ever been attributed to the consumption of Bee Pollen and this observation cannot be made of many foods. Bee Pollen is documented as being very beneficial in the treatment of chronic prostatitis, to help protect against the adverse effects of x-rays, to reduce the symptoms of hay fever. There have also been some studies to determine if benefit is realized in athletic performance and there is at least enough positive indication that further studies are warranted. An additional two years research program at the Pratt Institute in New York has shown that Bee Pollen can be used to improve crucial recovery power of athletes after stressed performance. Bee Pollen can also be used as a natural weight control to increase calorie burning; it also can increases strength and stamina without chemical side effects. Testimonial evidence indicates that Bee Pollen helps alleviate numerous aliments such as ulcers, colds, infections, allergies, and possibly sexual prowess (Devlin, 1981) Thorsons, 1989). Toi co 1 it phan hoa nhung chua biet cach su dung nhu the nao cho dung,co the dung de ngam ruou duoc ko? bai bao nay giup ich cho nhieu nguoi them kien thuc y nhu toi la rat can. Xin cam on. Neu co hinh anh minh hoa va so luong gr nua thi hay .